In the neighborhood you’re known for your grill game. You’re the rib-master, the steak king or the burger boss. When you’ve earned the title of grill master, you need a grill to match your skills. A 3 burner and even 4 burner grills are great for rookies, but once you’ve moved on to the next level, the 6 burner grill becomes the new frontier. The Final Sear: The Weber Summit S-670 is the top pick for the 6 burner group. Front and center: you get almost 900 square inches of combined cooking space, burners dedicated to specific functions, like searing, smoking, and rotisserie, and the unbeatable Weber quality and durability. For the casual griller, the 6-burner is going to be overkill, but the extra space can be a really great bonus when you’re firing up the grill every weekend or to feed a small army of friends and family. The extra square inches and bonus burners give you a ton of versatility, allowing you to cook meat and sides at different temperatures, no over or undercooking guesswork to deal with. You can even dedicate a burner just to searing! So let’s dive into the best 6 burner gas grills on the market and get you searing those juicy delicious steaks. The Weber Summit 7470001 S-670 Natural-Gas Grill is a beauty. You can’t deny it’s good looks and really, who doesn’t want a killer piece of eye-candy shining on their patio? You should also know the name Weber as being synonymous with quality and durability. The company is known for designing some of the best gas grills in the market across a range of price points. With six stainless steel burners, including a side burner, sear station burner, smoker burner, and rear-mounted infrared rotisserie burner, you can cook almost anything you would ever want to eat all in one massive unit. It offers a total of 838 square inches and 60,600 BTUs for a powerful experience. It also comes with Weber’s well-known flavorer bars for capturing the aromatic juices of the meat and two stainless steal workspaces. The Summit’s body is primarily made up of stainless steel so it’s especially durable. This grill also boasts an individual ignition system for each separate burner, so you do not have to light the whole thing just to cook one or two small items. You can also adjust the temperature of each burner to suit whatever you’re grilling, whether it’s salmon or a New York strip. 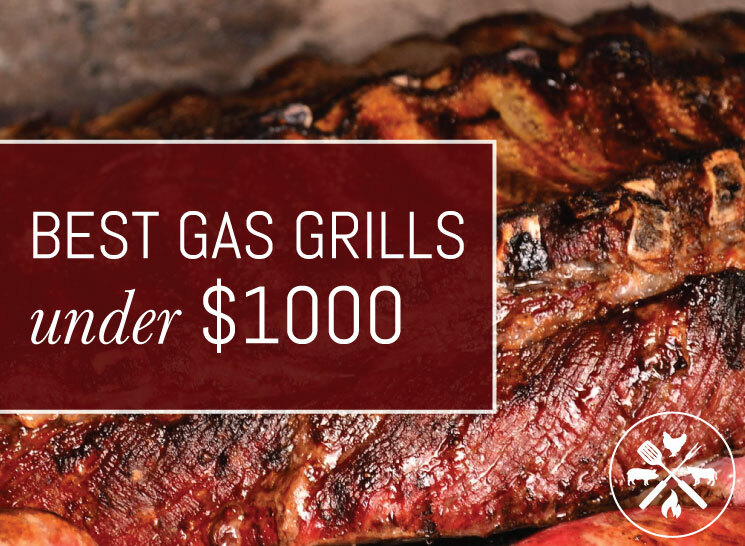 You can either get the Summit as a propane gas grill model or hook it up to your home and run it on natural gas – it also ranks as one of our picks for the best natural gas grills. While the Weber may empty out your wallet a little more thoroughly than some of the other grills on the market, its durability is a return on the investment. The first thing that stands out with the MegaMaster is how much cooking space you get for the price, as well as how much power they’ve packed in. It is one of the largest for overall surface area on this list and you can see how spacious it is just on first glance. Total cook power on the MegaMaster is an impressive 54,000 BTUs (a little less per burner than some of the others), with 543 square inches of primary cooking space over the 6 burners. It also offers 210 square inches of porcelain wire warming rack (perfect for corn or veggie grilling) for over 750 square inches of overall cooking area. The side tables on this grill are HUGE and great for any prep work you need to do and for keeping tools while you’re working. Or in my case, a cold beer or two. The electronic ignition makes grill start up fast and easy, and the built-in thermometer is great for regulating the cookbox temperature to allow for a perfect cook on those steaks or ribs. Like the other two grills in our top 3, the MegaMaster offers porcelain-coated cooking grates for easy clean up and excellent heat retention and transfer. It also comes with porcelain flame tamers to keep the burners protected and maintain even cooking across the grates. This grill is also on a heavy-duty cart with oversized cart-style wheels so you can move it around your backyard or into the garage for storing during winter months. The side tables do not fold down and are stationery, so if you are looking for something that can reduce in size for a more compact space, this isn’t the grill for you. It is also important to note that this grill has 6 burners, more than any other on the list, but no dedicated side burner. If that is a key must-have on your list, then look a little closer at the grills in the 1st and 2nd spots on our list for a better fit. If overall cook space for a budget price is your priority, then this big guy is your best bet and a killer value. Reviewers rank this grill highly on Amazon, with 4.6 out of 5 stars. The name “Regal” is so appropriate for this grill. It is massive, shiny, and tricked out with every bell and whistle you can think of. It’s definitely grill royalty. Of the three in our top spots, the Broil King is the most expensive, but it does pack in the best feature list and should be your go-to if you have an open budget and are looking for an insane grill experience. Let’s start off by talking size. The Regal offers 750 square inches of primary cooking area with an additional 250 square inches of warming rack. It features stainless steel cooking grids in the main oven compartment and cast iron grids in the secondary cook box. The overall power of this beast is also impressive, with 60,000 BTUs for the six main burners, a 10,000 BTU infrared side burner AND a dedicated 15,000 BTU rotisserie burner, with the kit included. Broil King’s signature Flav-R-Wave cooking system is designed to vaporize drippings and infuse the flavor back into whatever you’re grilling while simultaneously delivering consistent, even heat. The linear flow valves are also optimized to give you measured temperature control for a nuanced grilling experience. The Broil King features electronic ignition and a front-mounted temperature gauge. The overall build is primarily stainless steel, with chrome detailing on knobs and fixtures for ultimate durability. The knobs are also LED illuminated for evening grilling, so when it’s getting dark and you’re just not ready to call it quits, you can keep your grill session going. This grill also offers a ton of storage, with drop down stainless side shelves that include tool hooks, shelf slots and towel racks. The three under cabinets are perfect for storage and concealing the slide out mechanism for the propane tank, another detail feature we love. Grillers on Amazon are die-hard fans, raving about all the features and the smooth experience for grilling with an overall rating of 4.1 out of 5 stars. This 6 burner from Weber is not your typical backyard summer grill. This is a massive machine for a grill snob with all the bells and whistles you expect from the brand. It’s so large, my first thought was, you can throw a whole cow on there and cook it up. That may be an exaggeration, but it does boast 770 square inches of PRIMARY cooking area with an additional 228 square inches in fold away warming rack space. Porcelain-coated cast iron burners cover the space and provide a consistent, even cooking surface. The power on the E610 is also massive at 60,000 BTUs for the main burners plus an additional 12,000 on that lidded infrared bonus side burner. At this price point, we think a side burner should come standard for prep. Like all of Weber’s grills, this oen comes with their signature Flavorizer bars to vaporize drippings and infuse the aroma back into the meat, stainless steel burner tubes for optimal gas flow from back to front, and their new Infinity Ignition for consistent, quick start ups. Weber has also recently revamped their grease management system. Why does this matter? It’s just clean up stuff right? Nope, grease management matters because improper handling can cause flare-ups, which will scorch your meat and provide uneven temps across your cooking surface. Their new system funnels drippings that don’t end up getting vaporized away into the disposable drip tray in the catch pan. To clean, you literally just pull out the pan, remove the tray, pop a new one in and done. It’s so easy to access and disposal couldn’t be more hassle-free. Overall construction is just what you would expect from a Weber and this price point: high-quality stainless steel overall with top-grade finishings like the knobs and handlebars. The stainless side tables also provide hooks for tools and the cart style offers ample storage down below. Reviewers on Amazon consider this a favorite, with a killer rating of 4.4 out of 5 stars. This is a solid grill from Monument and a massive addition to any backyard grilling experience. It includes 6 stainless steel primary burners spread over 634 square inches of primary cook space in addition to the 266 square inch warming rack. It also includes an additional side burner for sauce or side prep. Overall power is an impressive 84,000 BTUs, the max on this list. The Monument also offers a stainless steel design with stainless lid and cook box, stainless steel cooking grates for even heat distribution, stainless steel flame tamers, electronic ignition system, LED control knobs, and zinc plated, removable grease tray for easy maintenance. It is mounted over a roomy lower cabinet designed to conceal the propane tank and offer additional storage. This is a great pick if you’re looking for a ton of cook space for your money. Royal Gourmet has a great line up of grills and this is another solid, and massive addition. The Mirage offers 465 square inches of primary cooking space, a 90 square inch warming rack, porcelain cast-iron cooking grates with a specialty slope design to lock in flavor, stainless steel tube burners, two separate stainless lids with built-in thermometer gauges. Total BTU output is 96,000 for all burners, including the infrared rear burner and shelf-mounted, lidded side burner. The build is primarily stainless steel with a huge under-cabinet, sliding tank rack and two side shelves with tool hooks for storage. The Genesis II S-435 is a little smaller than some of the other grills on this list, the 6 burners for this one include the side burner and the sear station burner. It only includes 4 primary burners with 48,000 BTUs of combined output. The sear station burner has 9,000, with 12,000 on this side burner. It includes stainless steel cooking grates, Weber’s signature Flavorizer bars, an easy-access grease management system, generous lower cabinet storage with rack style shelving, two side tables with tool hooks and the lidded side burner, as well as a front-mounted temperature gauge. The S-435 is primarily stainless steel construction with chrome finishings. Like all Weber grills, it is designed to last. This roomy offering from Char-Broil is a top pick for sheer size for the price value on this list and is a great pick if you’re not yet ready to splurge on a Weber. The Performance 650 offers a mega-sized primary cooking are at 650 square inches and an additional 280 square inches of secondary warming rack for buns and veggies. It comes with 6 primary burners, plus a 10,000 BTU lidded side burner. Main burner power comes in at 60,000 BTUs. It also comes with electronic ignition for quick and easy start-ups and a built-in lid-mounted thermometer. Overall construction and fascia is stainless steel, with a large lower storage cabinet for tools and to hide the propane tank. Stationary steel side shelves provide for extra prep space. This is a great offering from Char-Broil and one of the bigger units in their Performance line up. The Royal Gourmet grill is large and in charge and can’t be beat by any of the others on this list when it comes to overall square inches. It is especially roomy with 6 burners and a crazy 802 square inches of total cooking space (200 is for the warming rack). The overall cook power is 71,000 BTUs, which is more than many of the other grills on this list. It also includes a lidded side burner, which gets up to 9,000 BTUs on its own. It also offers a double-walled stainless steel lid for maximum heat retention, and an easy-to-use built-in thermometer for precision grilling. Like the other grills on this list, it also comes with a quick push button electronic ignition. The metal side shelf is great to use for prep work, but it doesn’t fold down for storing the grill away. Reviews are mainly positive, but fall slightly short of the top contenders on this list. The E-640 version of the Genesis is an incremental upgrade on the S-435 we talked about in the #7 spot and the E-610 in our very top spot. The outer construction and inner workings are almost identical, with a few small upgrades. What can you expect to see enhanced on the E-640? The overall cooking size is larger at 770 square inches (same as the 610). The power is also amped up on this model, with 72,000 BTUs for the main burners (the 610 has 69,000), but the side burner remains the same at 12,000 BTUs. The only other upgrade is a second handle light (the 435 only has one), which is a pretty minimal bonus. If you’re considering this model, it’s really only to get some extra cooking space and a little more power over the S-435 and E-610 versions of the Genesis. Reviews from other users are consistently strong for both models.